A textbook of life for everyone. Modern Science and Ancient Vedic Science discover the fabrics of immortality in the human physiology. This brilliantly researched book views human physiology in a completely different light from that hitherto known, and is highly recommended to be read by those belonging to the medical profession, and even the lay person. In this original research, Professor Tony Nader has sought to discover the true purpose of the form and function of the human physiology, and its relation to cosmology. It is interesting to note that he has studied and compared every aspect of human physiology, at all its stages—the DNA, cell, embryo, up to the adult human physiology, and found that at every level, there is a precise one-to-one correspondence between the structure and functions of human physiology and the 40 aspects of the Veda and the Vedic Literature, which are the fundamental structures of Natural Law, as brought to light by Maharishi in his Vedic Science. After a thorough discussion of the nature of consciousness as the basis of matter and the process by which it interacts with itself to produce the mind and body, Professor Nader discusses each of the 40 areas of the Veda and Vedic Literature with respect to the 40 fundamental aspects of human physiology. As one reads these striking correspondences, it becomes evident that one of Maharishi's unique contributions to the knowledge of the ancient Vedic Literature is that this body of knowledge is not essentially the written texts, but the basic frequencies, or reverberations of consciousness, which give rise to all the Laws of Nature governing human physiology and the entire universe. In identifying the human physiology as a precise expression of these underlying laws, Dr Nader establishes that the individual is the expression of the totality of Natural Law—the individual is cosmic. The book is a veritable encyclopedia of knowledge about Veda and Vedic Literature, including detailed lists of the various branches and sections of the Vedic Literature. Particularly fascinating is the section on the Vedic Devatå in the human physiology, in which Prof. Nader gives a scientific definition of Devatå as Laws of Nature or collections of Laws of Nature with specific administrative functions in the universe, and locates these Devatå, in structure, form and function, in the physiology. Gloriously illustrated throughout, this book revolutionizes our sense of what we are as human beings and gives a precise, scientific platform for understanding the individual as truly cosmic. Our physiology is continuously performing millions of tasks to maintain order and balance in its functioning, to allow growth and evolution to occur, and to bring about increasing achievement and fulfilment. The profound insights into the ancient Vedic Literature brought to light by His Holiness Maharishi Mahesh Yogi over the past forty years have guided the discovery that the laws that construct the human mind and body are the same as those that give structure to the syllables, verses, chapters, and books of the Vedic Literature. The human physiology (including the DNA at its core) has the same structures and functions as the holistic, self-sufficient, self-referral reality expressed in Rk. The specialized components, organs, and organ systems of the human physiology, including all the various parts of the nervous system, match the forty branches of the Vedic Literature one to one, both in structure and in function. This discovery has unfolded the secrets of orderly functioning of all the organs in the body and how this orderliness can unfold its supreme quality, expressed as the absolute order in the infinite diversity of the universe. This discovery has opened the possibility for human existence to rise to that level of order which sustains the universe and gives the experience of 'Aham Brahmasmi' - 'I am Totality' - to everyone. Professor Nader received his MD degree from the American University of Beirut, where he also studied internal medicine and psychiatry. His PhD is in the area of Brain and Cognitive Science from the Massachusetts Institute of Technology (MIT), where he was also a visiting physician at the Clinical Research Center. He completed his post-doctoral work as a Clinical and Research Fellow in Neurology at the Massachusetts General Hospital, Harvard Medical School. Professor Nader has conducted research on neurochemistry, neuroendocrinology, and the relationship between diet, age, behavior, mood, seasonal influences, and neurotransmitter and hormonal activity, and on the role of neurotransmitter precursors in medicine. His interest in natural health care led him, while at MIT, to conduct research on Maharishi Ayur-Veda herbal and mineral preparations for their safety, their effects on memory and behavior, and their ability to prevent aging and disease, including cancer. He also conducted original research on the effects of Maharishi's Transcendental Meditation and TM-Sidhi Program in solving social and international problems. Professor Nader's desire to gain total understanding of the human mind and body-of consciousness and physiology-led him to the study of Maharishi's Vedic Science and Technology under the guidance of His Holiness Maharishi Mahesh Yogi. He has organized courses and lectured widely on Maharishi Ayur-Ved, the ancient system of perfect health, in more than 50 countries, and held positions as a professor and director of Maharishi's Vedic Approach to Health Programs. He is currently International President of Maharishi Open Universities; International President of Maharishi's World Parliament or World Peace; Director of the Council of Supreme Intelligence of Maharishi's Global Administration through Natural Law; International President of Maharishi Ayru-Veda Universities; president of Maharishi University of Management, Holland; and President of Maharishi European University of Management, Brussels. Professor Nader was honored by Maharishi as Custodian of the Constitution of the Universe in 1997. He was also given the title Chakravarti by Maharishi on the day of Guru Purnima, 1997. 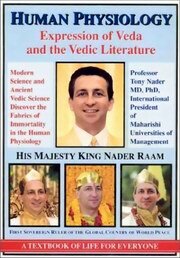 On the basis of his knowledge of physiology, Dr. Nader has successfully correlated each aspect of the Vedic Literature to a specific area of physiology, with the conclusion that human physiology is the expression of Veda and the Vedic Literature. This is the subject matter of this book. In honor of his discovery, Professor Nader received his weight in gold at a historic celebration in February 1998, at Maharishi Vedic University in Vlodrop, Holland, in the presence of Maharishi. This discovery has been appreciated by scientists and political leaders throughout the world, including the Presidents of India, Mozambique, Lebanon, Turkey, Trinidad and Tobago, and the Maronite Patriarch of Antioch and of all the Middle East. From 12 October to 16 October, 2000, during a five-day coronation ceremony (Rajyabhishek), Professor Tony Nader, was crowned the First Sovereign Ruler of the Global Country of World Peace, with its authority in the invincible organizing power of Natural Law, which naturally and eternally governs the evolution of all life everywhere. On 17 October, Professor Nader, honoured with the title Nader Raam, in keeping with the tradition of the Royal Rulership of Raam- the rule of Natural Law- graciously accepted his new sovereign role and announced the forty Ministries of His Global Country of World Peace, each upheld by the total Constitution of the Universe- forty values of the Vedic Literature- and yet also especially highlighted by one of the forty. The above title is 2000 editions with 610 pages and is in paper back edition.